In our house we burn a lot of wood to heat the place. I’ve been doing this for about 15 years and it sure helps on the fuel bill in the winter. This past winter I thought my daughter and I had enough wood to last us, but it was a cold year and we ran out of wood. So I spent more money than I wanted buying pick-up loads of wood to keep the house warm. I love a wood fire because it seems to put out more comfortable heat than a furnace that spreads the heat around through out the whole house and when you are ready to go to bed, the bedroom is cool. So, I put the word out that we needed wood for the coming winter. Next thing I knew, my neighbor, down the road, cut down some trees and brought me a pile of tree butts, and then he picked up another load from a lady who wanted to get rid on some and dumped them at my place. Then my other neighbor cut a tree and asked me to pick up the trunks. Suddenly I had a whole pile of green tree trunks piled up in front of my corral gate. Now I use my chain saw to cut these in 3- foot lengths and then use a maul and splitter to work on them. But fresh green butts are almost impossible to split with a sledge and splitter, in my mind I was looking at a full summer of splitting and stacking wood. As a friend of mine said; “That’s wood that warms you twice, once when you split it and once when you burn it.” But then, another friend of mine who cuts wood for a living brought me a splitter with a gas engine and my daughter and I went to work. Even with the splitter, it took us the better part of a week to split all the wood I had gathered up. 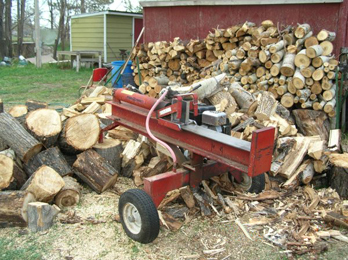 Back in the old days, it was a full summer job to cut, drag and split wood to keep the house warm in the winter. The older I get the more I wonder how the old timers handled it. But they were strong and had plenty of muscle … problem was their life span was about 60 years and I can understand why. I am getting to the age now where I am just played out … that is unless I am horseback. And I do remember some of the old days of splitting wood for the cook stove in the summer. I even remember that we didn’t have electricity on the ranch in Montana where I worked. We had coal oil lamps for light and mostly went to bed about dark, but were up at daylight to get the chores done and then a big breakfast before heading out to spend the day either working the irrigation ditches, fixing fence, moving cows a horse back, doctoring cattle or haying. Haying time was the longest days spent. That was because it was all done with horses. And being the youngest there I drove the rake team, except when the boss thought I could drive the stack team. That was when I dropped a load of hay on his head and crushed his new straw hat and I went back to the rake. It was a wonderful time for a young boy but I am thankful for the modern conveniences we enjoy now. However all that wood was dropped off in front of my horse corral gate and I had to get it split and moved in order to get in and out of the corral with my horses.